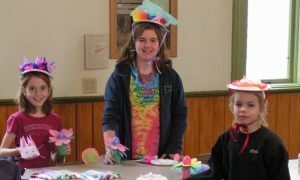 Get ready for your Easter celebration by making a special paper bonnet and creating other decorations that will add color to any celebration. Stop by anytime between 12:30-3:30pm to participate. Children must be accompanied by an adult. Pre-registration is recommended, but walk-in registration at the door is welcome. Hosted by the Oswegoland Heritage Association in partnership with the Oswegoland Park District. Suitable for ages 3+ with an adult. Free.